Going to Japan was fulfilling a long time desire of mine to explore the country’s wonderfully fascinating culture. In many ways, Japan is incredibly modern, and yet it’s very much rooted in tradition. There is order and cleanliness that can’t be rivaled anywhere else in the world. My version of heaven. Taken at Osaka Castle. I spent the majority of my time in Kyoto and surrounding areas while Tokyo bookended our visit as we were flying in and out of Narita airport. I’m really happy with that choice as I really enjoyed Kyoto among all the cities we visited. This was a first taste of Japan for me and I was a bit overzealous about wanting to see everything. 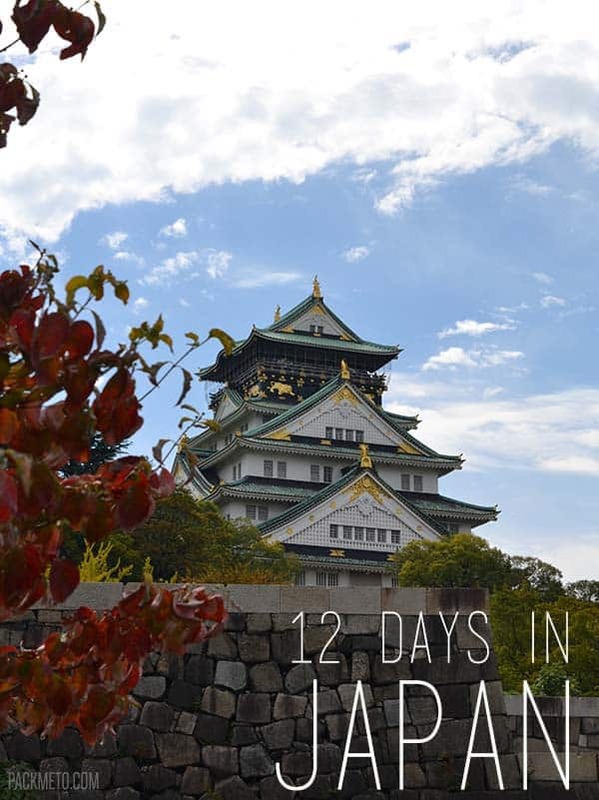 That said, here are highlights from my 12 days in Japan along with some comments on how I’d structure this itinerary if I were to do it all again. We arrived late in the day. Getting out of the airport was an ordeal and a half with numerous lines and lots of paperwork which is no fun when jet lagged. 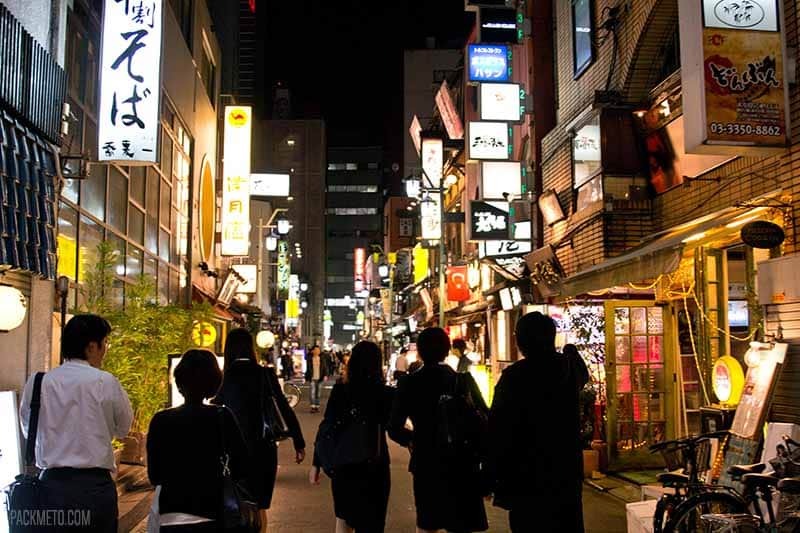 When we got off the Narita express, all I really remember is a sense of being completely overwhelmed by all the bright lights and people in Shinjuku. No matter how much you travel, arriving in a new country is always a jarring experience. There’s no shame in taking a taxi when you can’t figure it out. Day two dawned early for us due to jet lag. Pro tip: Shibuya is dead at 8 am in the morning. I don’t know what we were expecting, but it was incredibly eerie to be wandering the normally crowded streets of Tokyo when everyone was still asleep. Wandering around Shibuya. Where are all the people? 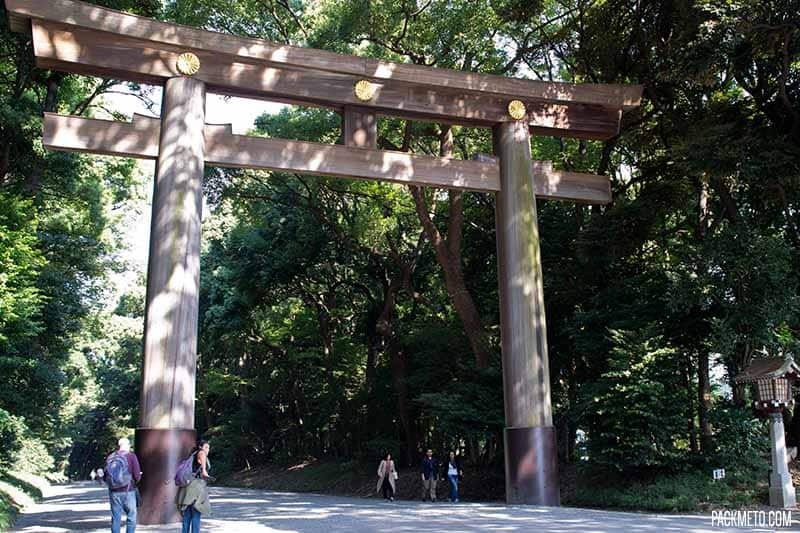 We went to Yoyogi Park and explored the Meiji Shrine. The park is huge and takes a while to walk around. We wandered through the mostly closed Takeshita Dori (Takeshita Street) in Harajuku. After an energy boosting afternoon nap, we went up the Metropolitan Government Building (it’s free!) to see Tokyo from above. Later at night we went back to Shibuya and experienced the crossing first hand with lots of people. There is no rush like trying to get around people without getting bowled over yourself. A lot of fun! Be prepared to do a LOT of walking. Things may appear close together on the map, but really, they’re not. I wish we went back to Harajuku when stores were actually open. To take advantage of our jet lag, we got up early to go to the Tsujiki Fish Market, but not early enough to see the blue fin tuna auction. 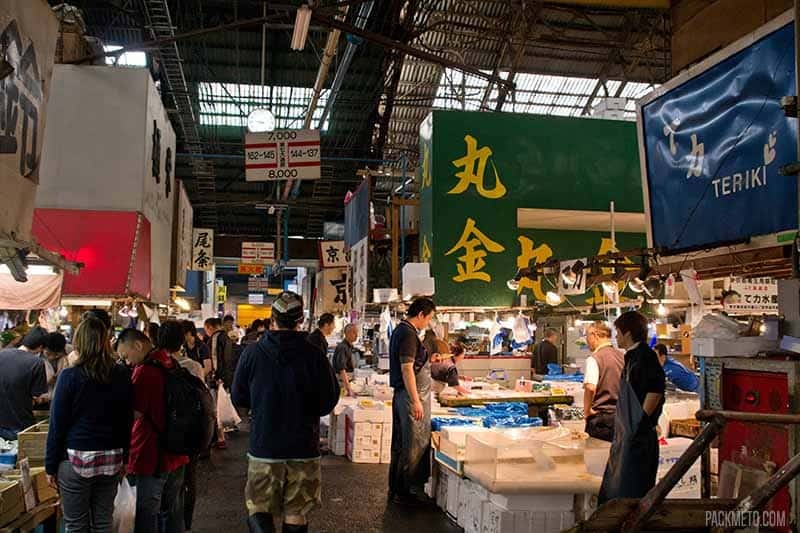 Instead, we timed our visit for when restaurants and food stalls would be open so we could grab breakfast before wandering through the market itself when it opened to the public at 9. Our next stop was the Tokyo Imperial Palace which was anticlimactic. The palace is closed to the public and you can barely catch a glimpse of it among the throngs of tourists clamouring to get a photo of a building far off in the distance. When going to Japan, people tell you to visit a themed cafe. Our choice was the Gundam Cafe as my friend is a fan. Beyond its name, I really had no idea what it’s about, but I was happy to tag along for the experience. So much anime everywhere you look in Akihabara. The Gundam Cafe is located in Akihabara area of Tokyo which we explored next. It really is like a world of its own. 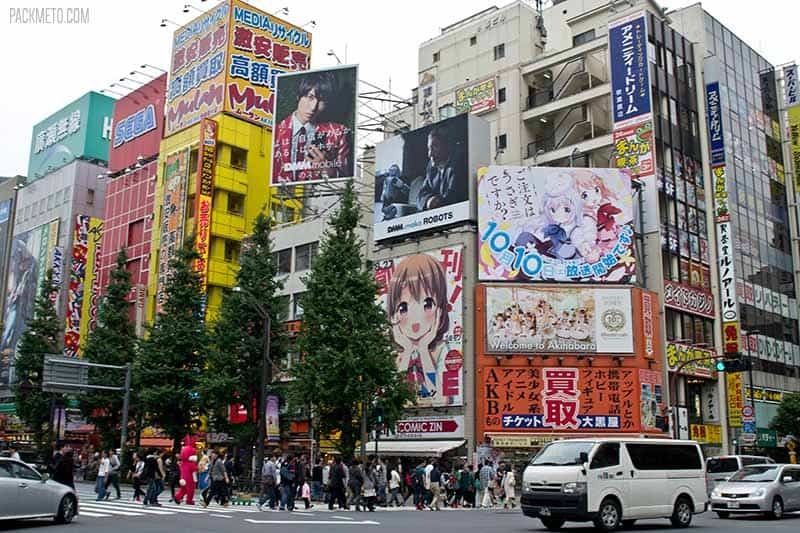 You know you’ve arrived by the multistoried manga character billboards staring at you. Everywhere you turn are massive stores selling manga and anime books and collectibles. It’s incredibly overwhelming, but also really fascinating to walk through these stores. 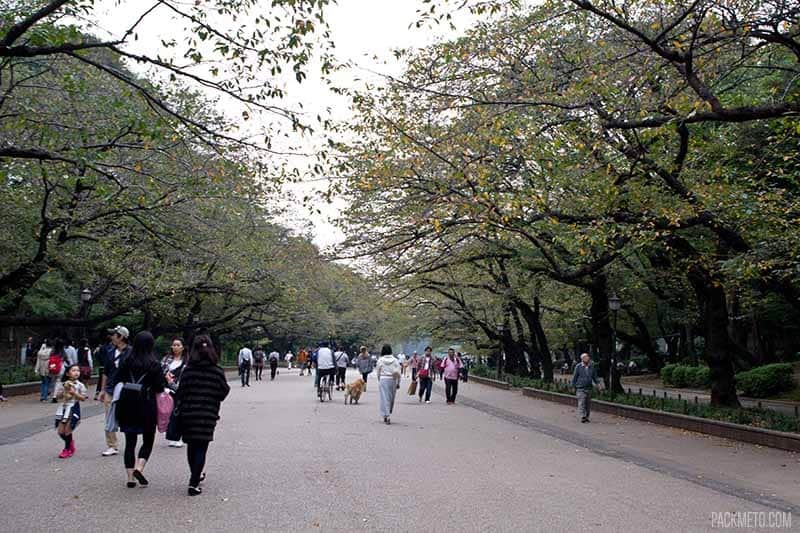 Our last stop of the day was at Ueno Park which is home to a number of museums and shrines. We skipped the museums but wandered around the park checking out the shrines. Skip the Tokyo Imperial Palace. It’s not worth the effort of going out of your way to see it. Alternatively, I would have gone on our last day of our trip when we had some time to kill by Tokyo station. This was a rest (aka lazy) day for us as we went from Tokyo to Kyoto. 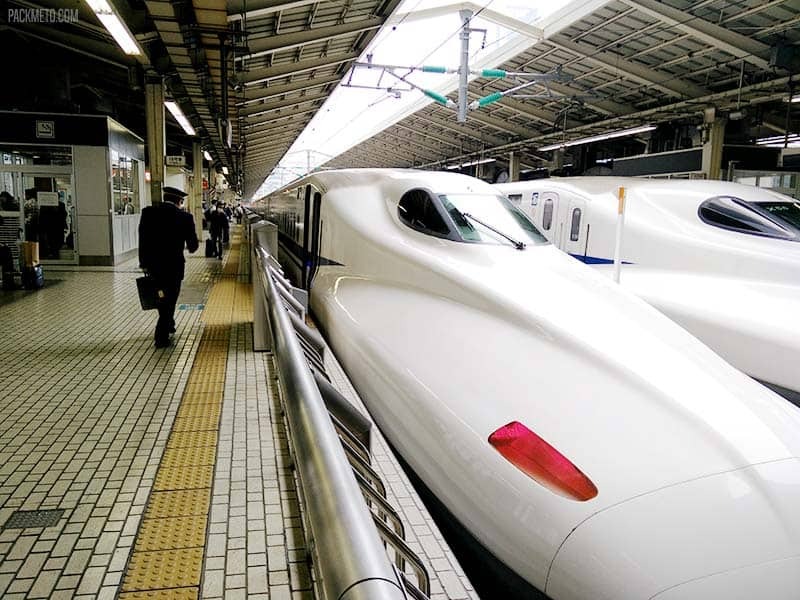 We caught the Shinkansen which took 2.5 hours to travel about 500 km. Very impressive! At first I could really feel how fast the train was speeding through the countryside, but it soon lulled me to sleep and I napped through most of the journey. We spent much of the day in transit and only set out to explore in the evening for food. The inspiration for much of our Kyoto itinerary was based off the itinerary suggestions from Inside Kyoto. With roughly 2000 temples and shrines in the city, there was plenty to see and it helped guide our days. Our first day in Kyoto was all about the temples! We visited a handful including the Kiyomizu-Dera Temple, Kodai-ji Temple, Chion-in Temple, Shoren-in Temple and the Heian-Jingū Shrine. That’s a lot of temples in one day! I loved wandering through the streets between the temples. 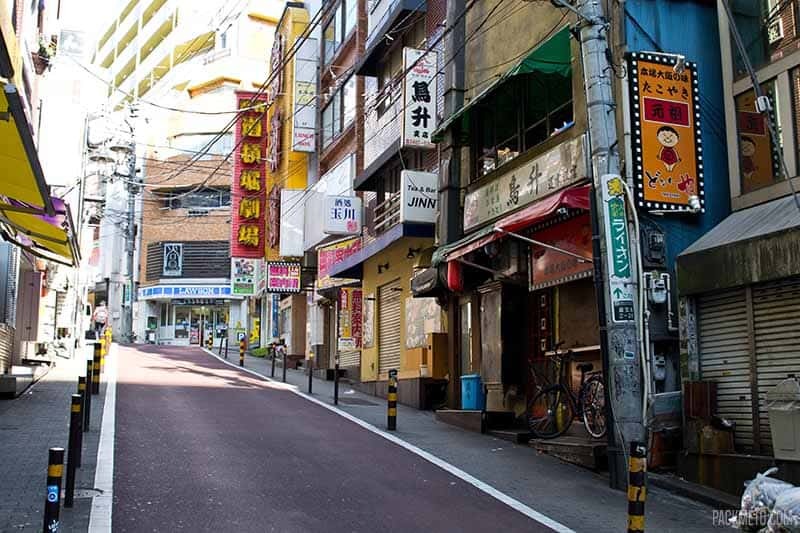 These streets embodied everything I imagined in traditional Japan. However, due to the early hour (darn jet lag!) a lot of the restaurants and shops weren’t open yet as we ambled through. 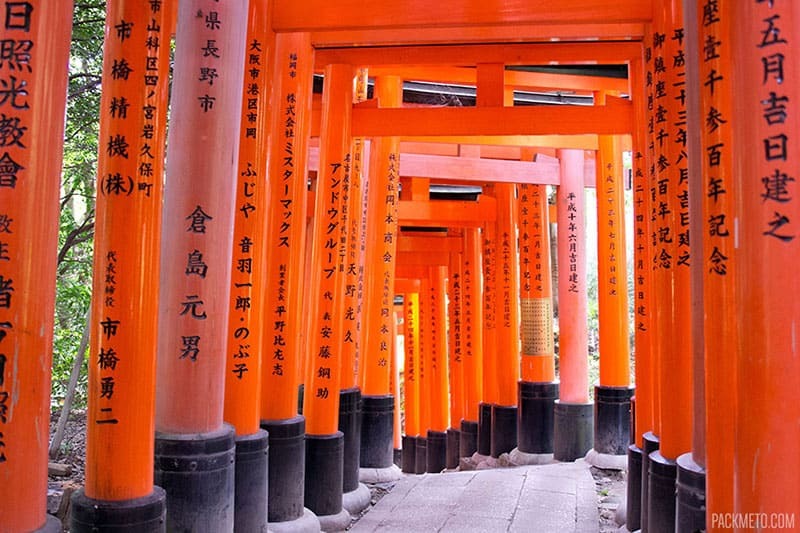 We wandered through the Nishiki food market in search of lunch before heading to the highlight of the day: the famous Fushimi Inari Taisha shrine with its thousands of bright orange torii gates. Unbeknownst to us, our visit coincided with a Japanese national holiday so the shrine was packed with people. Despite that, there were moments of tranquility which made it much easier to appreciate the beauty of the area. I probably could have just skipped a bunch of the temples. A lot of them didn’t have much of a ground area to wander through and you needed to pay to go in. 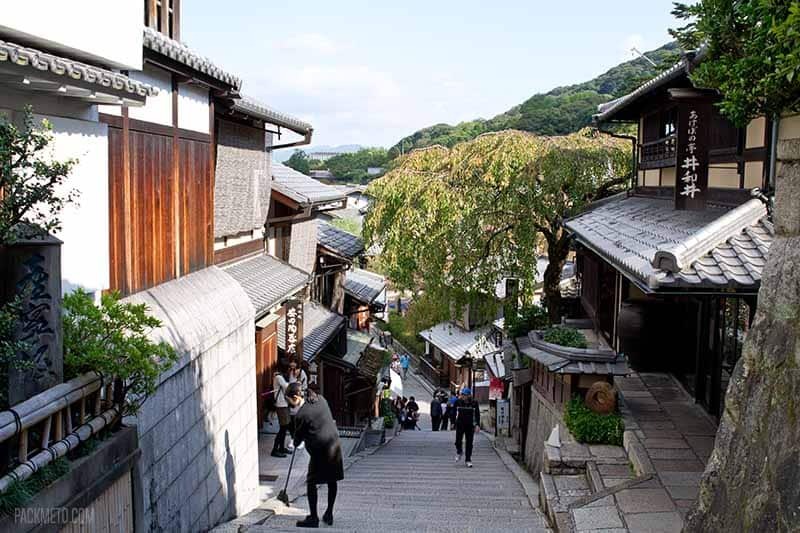 Go inside Kiyomizu-Dera which is UNESCO site. There must be a reason why right? Be prepared for even more walking in Kyoto! Often on foot is the best route instead of trying to catch a bus. Find out if there is a Japanese national holiday when you’re visiting and avoid high traffic tourist spots! We started the day off by exploring Daitoku-ji temple which is known for its Japanese gardens. We found most of the buildings closed to the public which may or may not always be the case. Next up was visiting the Nijo-jo castle. This wasn’t originally in our itinerary, but we had some time to kill before heading to our next destination. It was quite pretty and interesting to wander through and the grounds are massive. The thing I was looking forward to the most was visiting the bamboo forest in Arashiyama on the western outskirts of Kyoto. I met up with Anna of Slightly Astray and we wandered through the pathways filled with people as tall leaning bamboo towered above. There were a lot of people. Uncomfortably so. While in Arashiyama, we also visited the Tenryu-ji temple and its gardens. Our last stop for the day was the Kinkaku-Ji temple also known as the Golden Pavilion. This was a case of it being a good thing to not have done much research for this trip, because when I turned the corner and saw my first glimpse of the stunning building, it was mesmerizing. I hadn’t expected to see such a brilliantly bright colour in the building, perfectly reflected off the surrounding water. It really was stunning. There isn’t too much else on the grounds, but seeing the temple in person was more than worth it. Skip the visit to Daitoku-ji temple. There really isn’t anything to see there that we could find. Those in the know suggest going to the bamboo forest in the early hours to beat the crowds. I’d highly suggest you do this to avoid having to walk over people. This day was all about the deer! The deer in Nara that is. We took a day trip to Nara which is an hour train ride away. 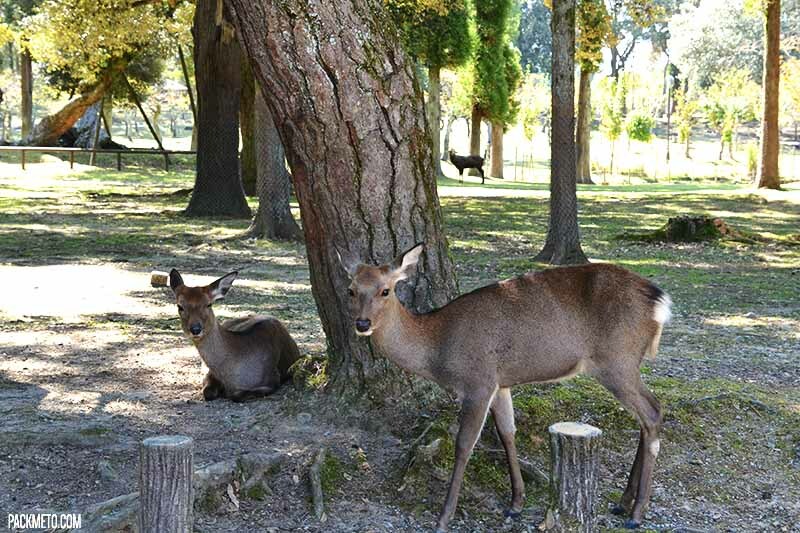 We were headed to Nara park where 1200 wild sika deer freely roam. 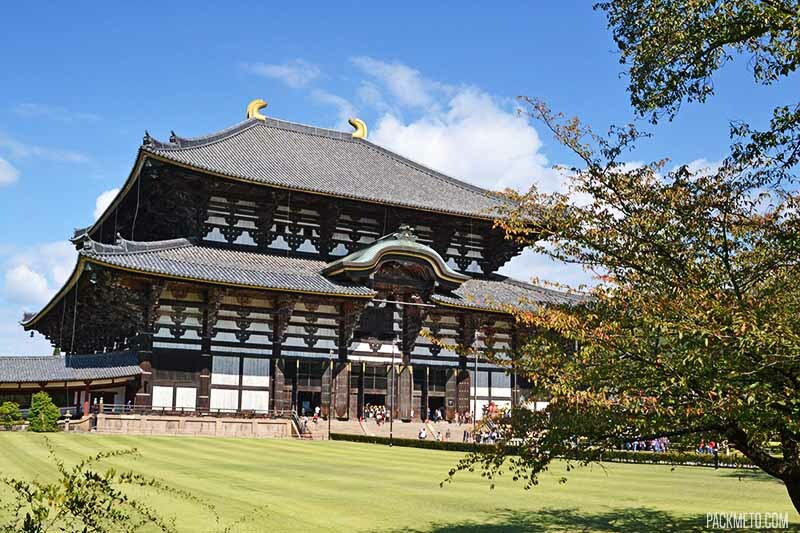 After getting our fill of the deer, we visited another famous Nara landmark: Todai-ji temple which is home to the largest bronze statue of the Buddha Vairocana. We also wandered through the grounds of the Kōfuku-ji temple before for leaving the city. This should have been a rest day after all the walking around Kyoto! 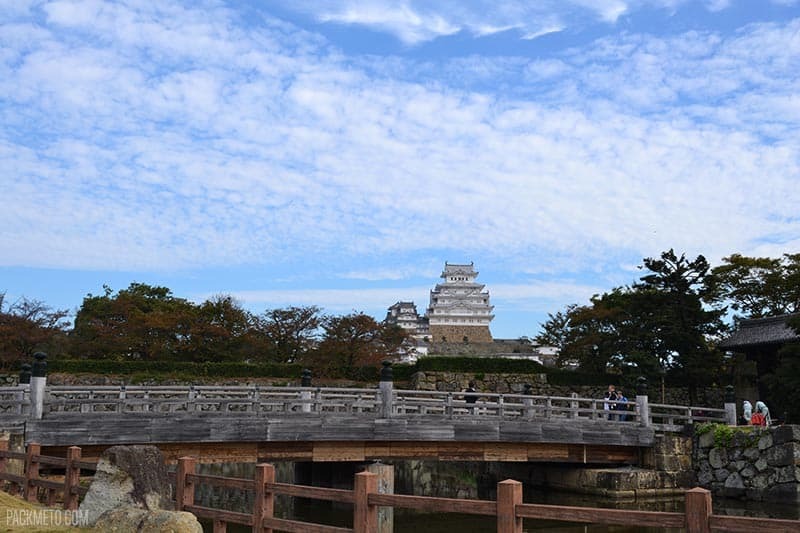 This day was another day trip day combining our visit to Himeji and Osaka into one day. Our reason for going to Himeji was to take a look at the castle which stands on a hilltop overlooking the rest of the city. It’s stunning to look at from the outside, but inside leaves much to be desired. Much of the building was empty and could definitely have been put to better use. 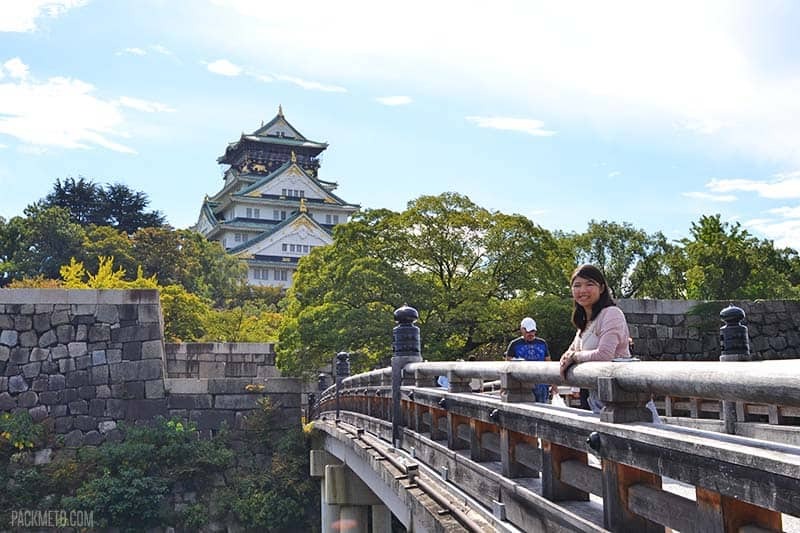 Next up was Osaka where we visited another castle before meeting up with Anna again. She took us wandering along Dotonbori, saw the famous Glico man, and enjoyed some takoyaki on the street. After being in a relatively quieter Kyoto for a couple days, being back in a busy city like Osaka was a bit shocking. The craziness of Dotonbori street in Osaka. The inside of the Himeji castle leaves much to be desired so I’d probably skip it next time. That said, it’s a long way to go to just see the outside of a castle. Osaka is great if you want to eat and go shopping. In terms of sights, there isn’t too much. This day was a rest day. We were exhausted from all the walking and day trips in the previous day. We spent much of the day souvenir shopping and eating. I had my most favourite bowl of ramen of the whole trip in Ippudo which was probably the highlight of the day. This was another transit day as we went from Kyoto back to Tokyo. 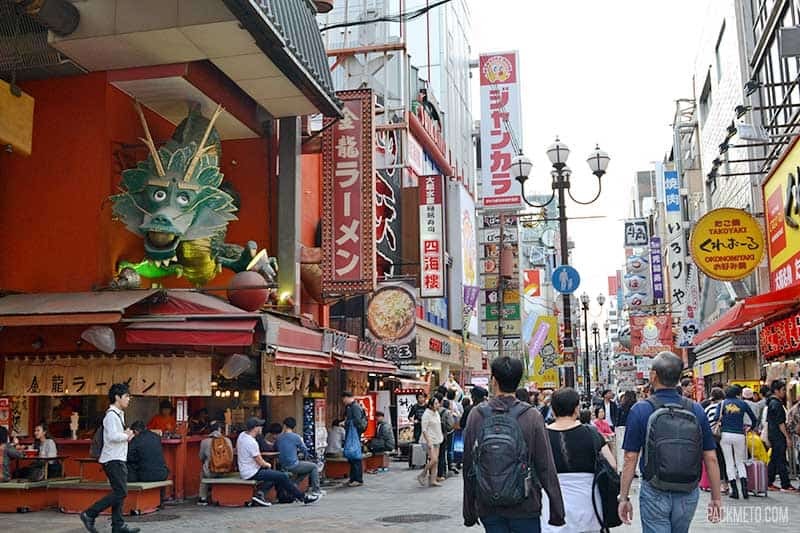 This time we were staying in a different neighbourhood: Asakusa. This had a completely different feel to it compared to Shinjuku. Much more relaxed. 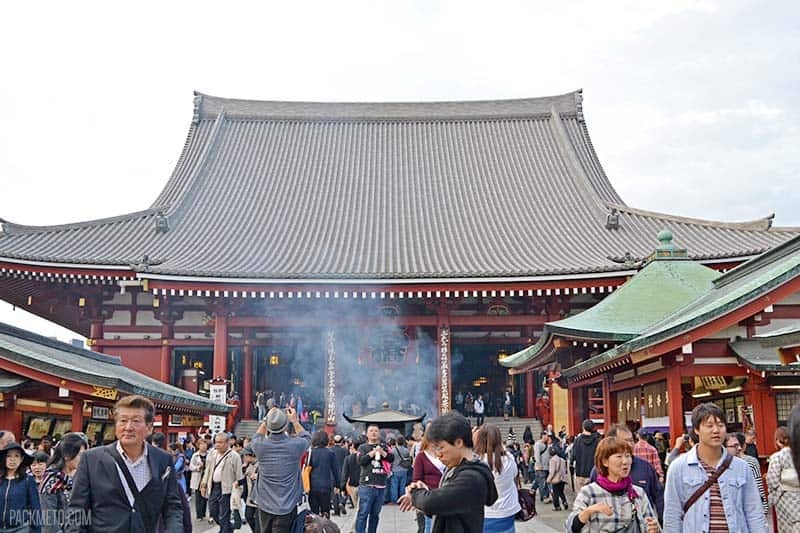 After getting our bearings, we headed to Senso-ji temple which is Tokyo’s oldest temple. We also walked to the water to take a look at the Tokyo Skytree and the Asahi brewery headquarters. This day was a rest day for me and I spent most of it aimless wandering around Asakusa. I did a lot of my souvenir shopping and just got lost. It was really nice. I brought home a bag full of Kit Kat. 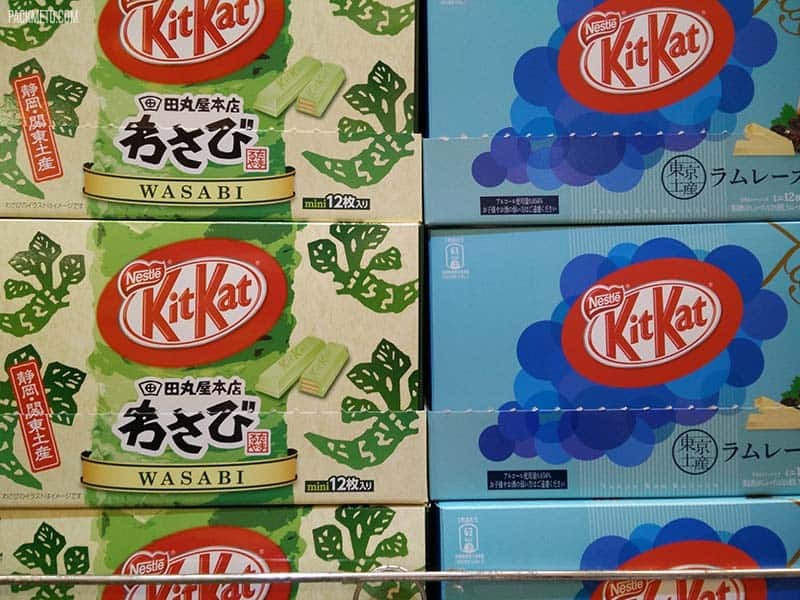 Wasabi Kit Kat anyone? Dinner was at a number of izakayas under the train tracks in the Yurakucho area close to Ginza. Quite the experience! The izakayas all have a table fee when you sit down. Makes izakaya hopping a bit on the expensive side! This was our last day in Japan. With a flight leaving at 6 in the evening, we only really had a couple of hours. We stored our luggage at the Tokyo station in one of their lockers before heading out to see the Tokyo tower. We had a lot of extra time. 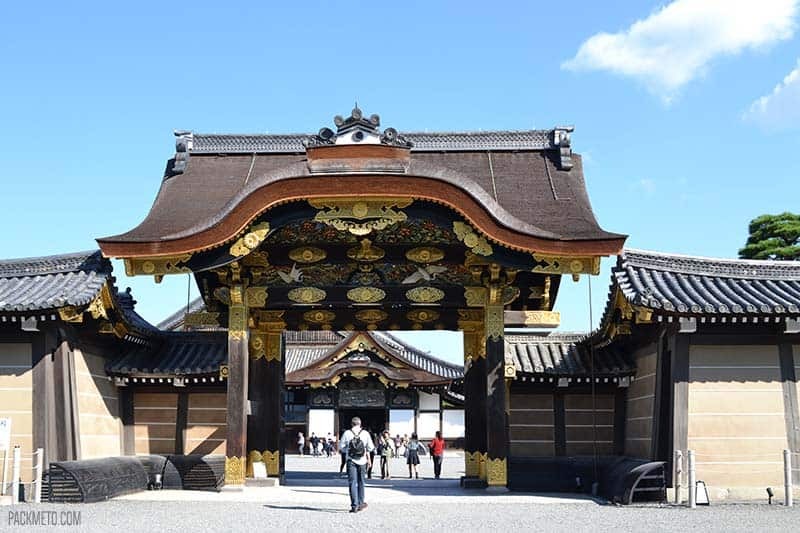 We probably could have included a visit to the Imperial Palace on this day as well instead of cramming it all in at the beginning of the trip. The Japanese transportation system can be confusing at first, but once you figure out the system, it’s quite easy and efficient. 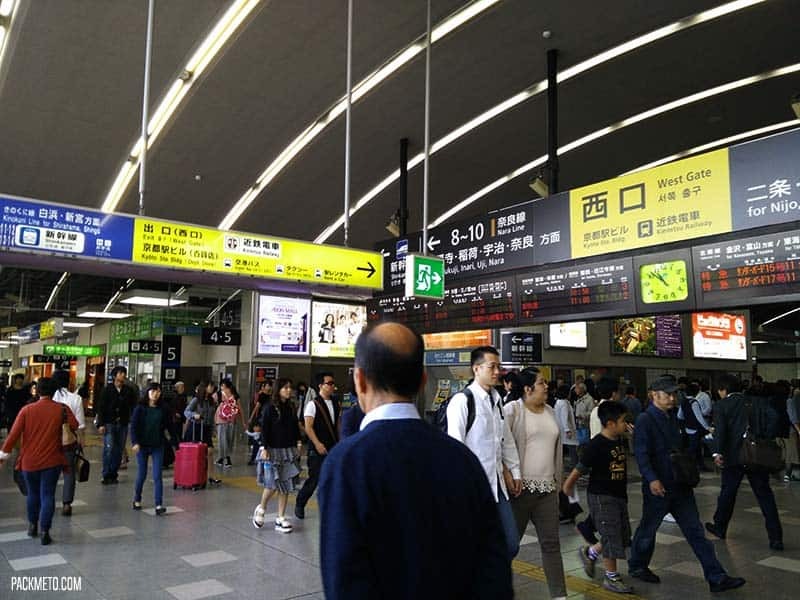 We got around with a combination of the Japan Rail and with the city’s transportation system. We each purchased a 14 day JR rail pass. We probably could have made do with just a 7-day pass and used it from Day 4 to Day 10, but when we calculated it out, the savings weren’t huge and having the pass gave us peace of mind. To see if the JR pass is worth it for you and to look up train schedules, Hyperdia is a great resource. This JR rail pass is ONLY good for JR trains. It was okay to use for getting around Tokyo, but stations are spread apart and you will end up walking a lot. 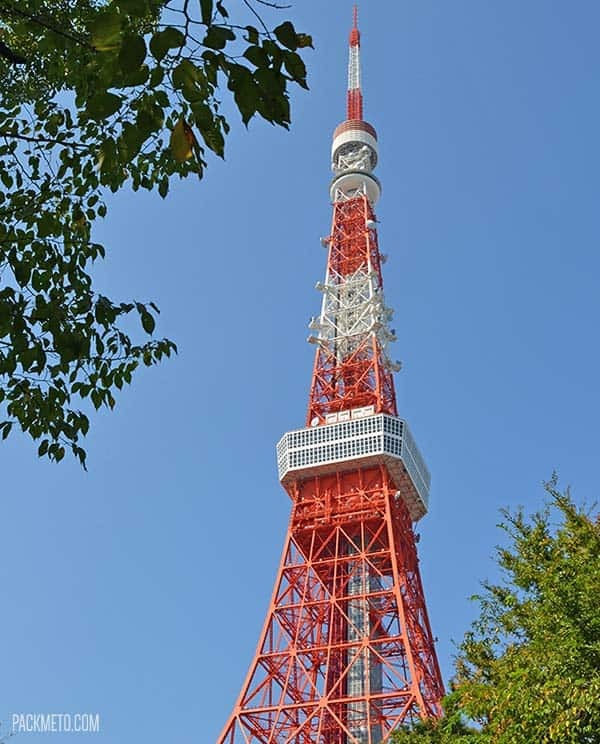 If you’re only staying in Tokyo, the JR pass is not worth it for you. If you are traveling long distances on the Shinkansen, I’d recommend getting a reservation. There are generally a few cars that don’t require a reservation, but they can get full very quickly. We didn’t have a reservation for the Himeji to Osaka section and ended up hanging out between compartments. To get around Kyoto, we bought a two day combined subway and bus pass (¥2,000) to get around for Day 5 and 6. This was completely worth it as we took a lot of buses. We only took the subway once so next time I would just get the bus day pass (¥500). Otherwise, each ride is ¥230. An example of a fare calculator for the Tokyo subway. Back in Tokyo for the second time, I took it easy and didn’t leave the Asakusa area. When I did, I just paid the price of my metro ticket which you can calculate using charts they have available in the stations (or online). The most I ever paid one way was ¥200, but it depends on the distance of travel. 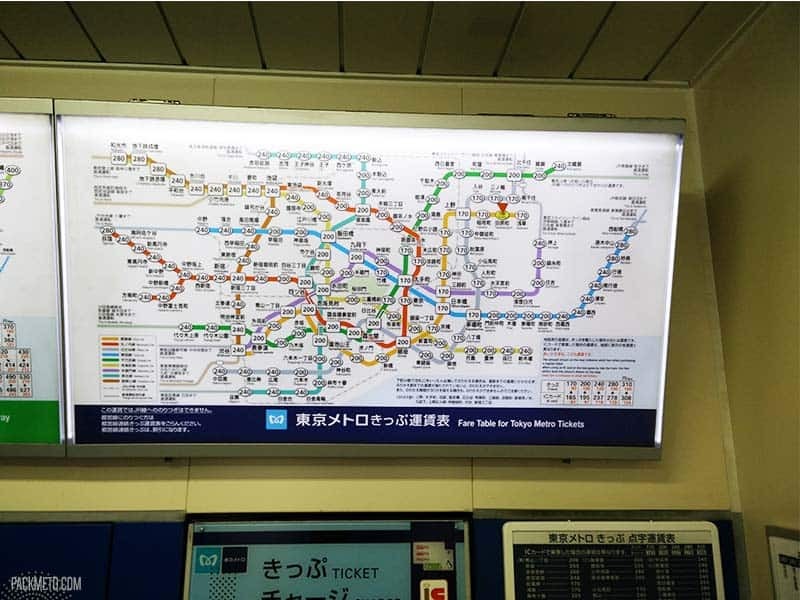 My friend bought a day pass (¥600) which made it easy for him to get around. So there you have it. How I spent 12 days in Japan and what I’d do if I were to do it all again. Looking back at it, it feels like it was a lot of tourist sites and running between them all. Next time I’d like more time to just wander around. I know this is just the first taste of Japan for me and that I’ll be back one day. Have you been to Japan? Where did you go and what did you see? 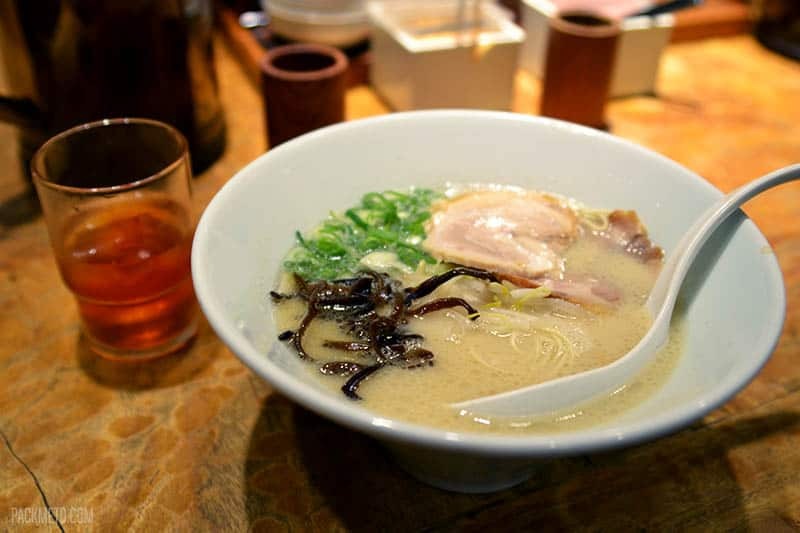 Adelina, thanks for sharing your trip to Japan. We also did our first trip there recently. We stayed near Akihabara which was pretty good, and had 6 nights in Tokyo which was great. We also had 4 nights in Kyoto and really loved it. 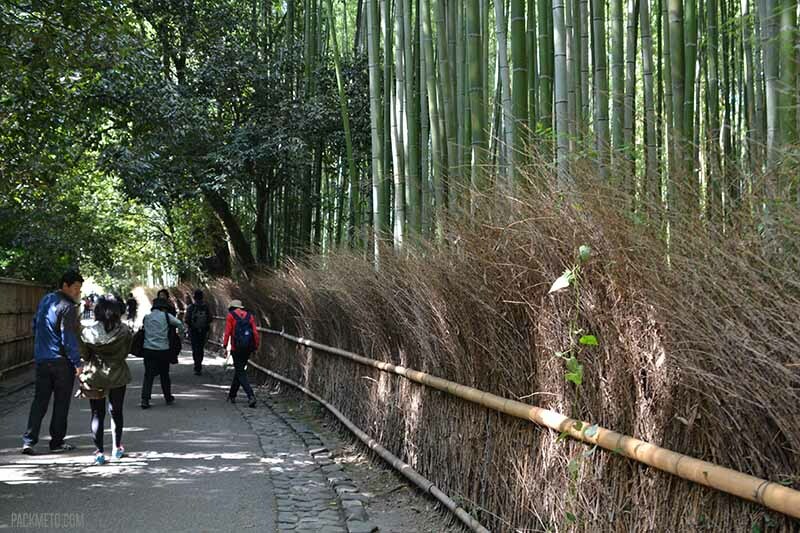 We went to the bamboo grove early and it was very restful, but the crowds certainly increased quickly after our visit. 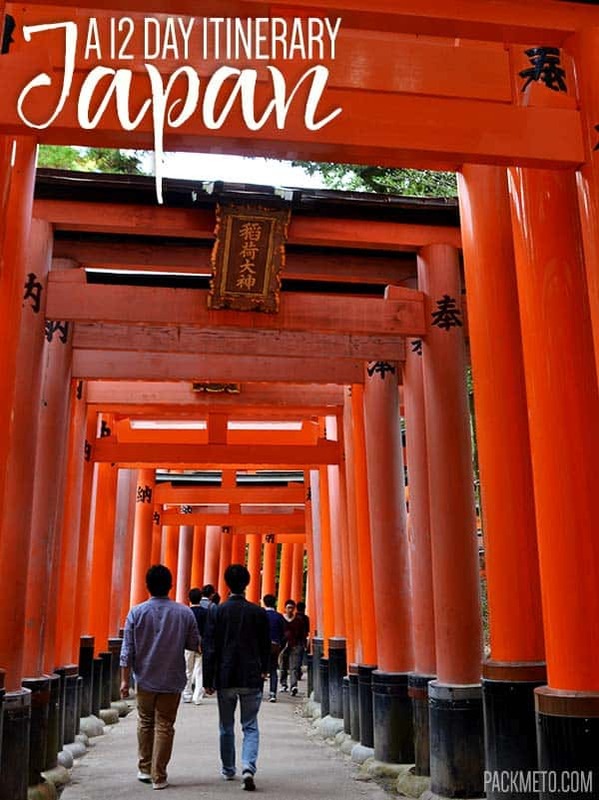 I think you need to be very selective on which temples you visit – with our children we decided to only see a few, which included Fushimi Inari which was great! We also had 4 nights in Nagano in the mountains which was a real contrast to being in the big cities. We would have loved to visit for a longer period of time but unfortunately could inly go for our school holiday period. Ooh! I bet your kids loved staying in Akihabara. I was so overwhelmed by everything I could look at haha! It sounds like you guys had a great trip. I would have loved to see Nagano and like you said, have a change from the cities. I’ll have to go back one day! The sights you saw in Kyoto and Tokyo were also some of my favorites. I would have enjoyed seeing the bamboo forest and the Nara deer, but we didn’t have time. I don’t know if it was a public holiday when we were there. It was Cherry Blossom season and everything seemed packed with Japanese tourists. The Kyoto taxi driver even pulled over after being stuck in traffic for too long and suggested that it’d be faster if we walked. Yikes! I don’t think it would have been much fun going there during cherry blossom season. I’m told it gets really chaotic during that time. At least you had a good taxi driver who didn’t try to price gorge you. I am planning a trip in a few weeks time, which will be Cherry Blossom Season and also school holidays in Japan, I have heard bikes are a good way to get around, have either of you tried this? I didn’t get a chance to ride around on bikes, but I saw a ton of them around, especially in Kyoto. If you’re comfortable on them, then go for it. It’s definitely a common transportation option for locals. Thanks! 😀 I can’t wait. There’s so much to see, I don’t know how I’d squeeze it all in on foot! For sure! I would love to go back and explore other regions one day. Oooh this was really helpful, thanks. I have my eye on a holiday to Japan in a year or two, but am slightly overwhelmed by options! This gives me a great roundup of what worked and what didn’t. What was your absolute highlight? Thanks so much for sharing! Thanks Rachel! I know what you mean about being overwhelmed. I felt that way planning this trip. So many options! My absolute highlight? That’s a tough one. Probably the things in Kyoto: I loved the Golden Pavilion, the fushimi inari and the bamboo forest. All major tourist destinations but I feel like they all live up to the hype. Otherwise, I really enjoyed the food and the convenience stores are just so awesome. Japan is great! The map looks scarier than it actually is. It’s no more difficult than the ones in Europe and parts of the US. Hopefully you’ll get a chance to go one day. Thanks Christine! Getting around Japan isn’t too bad once you figure it out 🙂 Kyoto was lovely so I hope you get a chance to go one day! We did a similar trip last December – Starting in Hakuba and ending in Kyoto for New Years. It was an incredible trip, but the travel was so exhausting because nothing seemed necessarily “easy.” Either way, I wouldn’t change it for the world! If you make it to Japan again, I recommend checking out Okinawa – it’s beautiful and full of culture. I write about it a lot on my blog (I lived there for nearly 3 years) so check it out if you ever find yourself heading that way! Definitely agree with nothing being really “easy.” It certainly got easier, but there was so much that was really confusing all the time! I definitely do want to go back to Japan and go to the south. I’ve heard really great things about Okinawa. One day! Great post! Definitely saving this one for later – would love to get out to Japan (especially Tokyo) soon – thanks for sharing. Thanks Madi! I hope you get out to Japan. It’s an amazing country. Haha, yea, there was so much to experience! It’s really overwhelming to even think about despite having experienced it all! This was quite a trip, Adelina. I never went to Japan or anywhere in Asia, so I’d love to see Kyoto and all these other beautiful places in Japan. Thank you for these recommendations. Thanks Anda! Japan is a great introduction to Asia if you ever decide to head that way. Kyoto is beautiful and surprisingly really easy to navigate. Yes, it really was a busy trip. Almost too much! But those temples were fantastic. Wow, you did a lot in 12 days! I’m planning a trip to Japan in the future and I only have the really touristy things on my list of things to do/see so far: the castle in Osaka, visit the robot restaurant in Tokyo, and stay in a capsule hotel. Thanks for sharing your notes and lessons learned — it’s good to get an idea of what other sights are worth seeing and what can be left for another trip. Thanks for reading Carla! I know what you mean about only the touristy things. That dominated a lot of our itinerary, but I’m happy I had a chance to just wander around in Kyoto and in Asakusa in Tokyo too. Those two days gave me more of a feeling of a place instead of just running from place to place. I’ve heard great things about the robot restaurant so you should definitely check it out (but book early though so I’m told). Love this post! Japan has also been on my bucket list for a while! I would love to try those kit kats! Thanks! I loved tasting all the candy varieties I spotted in Japan. Thanks to share you travel! The last year my wife and I traveled to Japan, and we visited Yokohama and the marvelous China Town, and we add to visit the Great Budda in kamakura. I recommend visit also in Kyoto the Golden Pagoda, this is a marvelous place. I want go back soon again!! 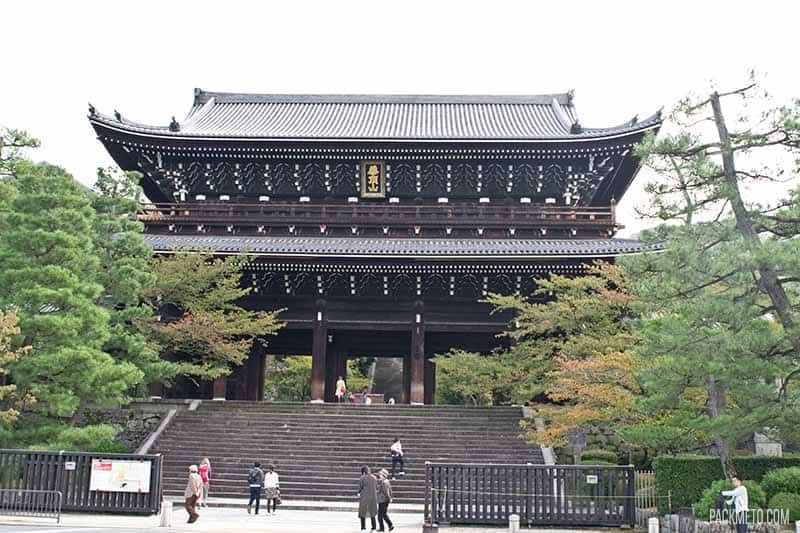 I recommend in Kyoto the Sanjusangen-do Temple (national tresaure) founded in 1.164 ad and his 1.001 Kannon statues. I was in the Hotel in Train station was marvelous.